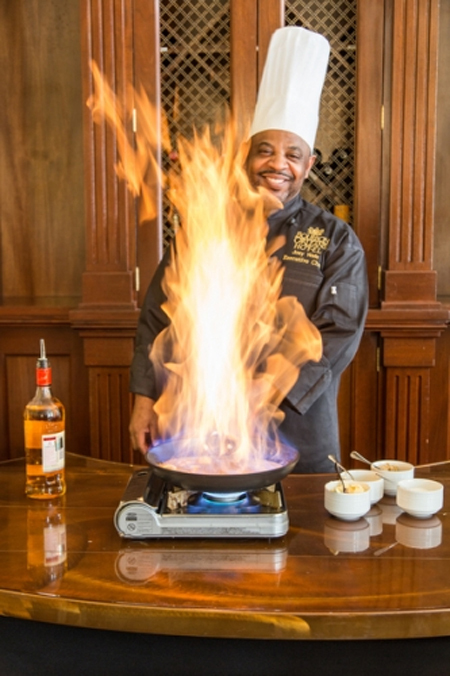 Of all the historic hotels in New Orleans, Bourbon Orleans is perhaps the most interesting. It has a unique history and a few spirits of the past that still remain. I had the pleasure of staying there on a press trip for Travel South recently and so enjoyed the decor, atmosphere and comfort. The hotel is conveniently located on Orleans St. between Bourbon and Royal. 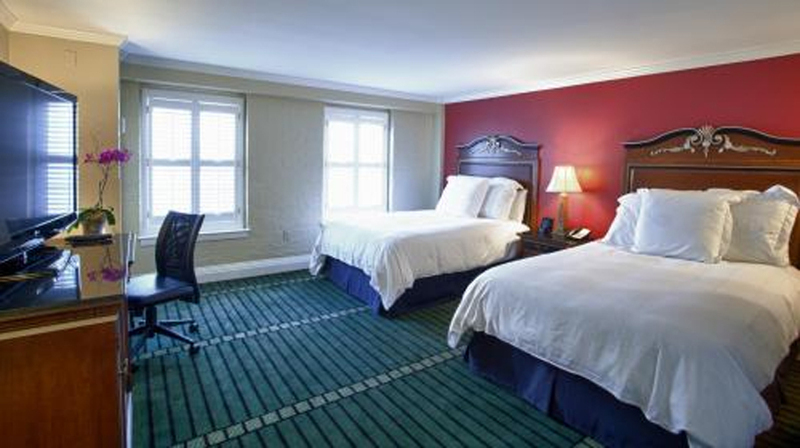 Accommodations range from roomy guest rooms with either two double or queen beds or one kind. Their pillow-top mattresses are an instant invitation to dreamland or a perfect perch to watch the 42" flat-screen TVs. There is also a comfy couch to relax on. Rooms have a wet bar with complementary coffee or tea. Plantation shutters and a Plantation Style wide bladed ceiling fan give the feeling of old New Orleans. You've got your choice of complementary wired and wireless Internet and a safe to lock away your valuables. If you want to move up, literally, try a Bourbon Balcony on the third floor of the hotel. You'll have a two level floor plan, with a spacious living room and large wet bar downstairs. 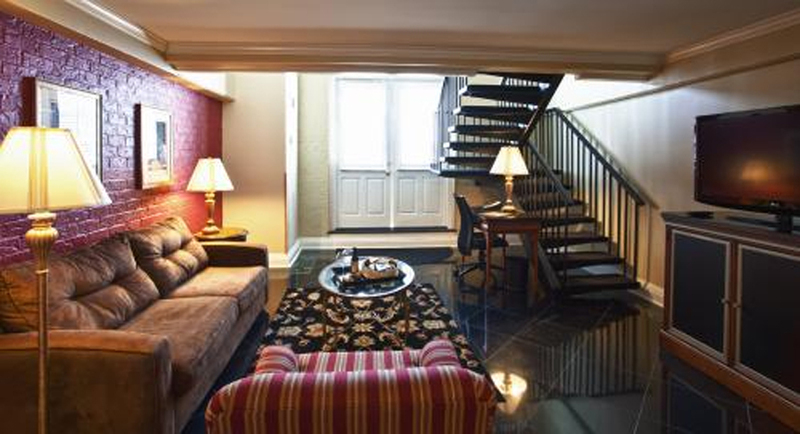 You can step through French doors onto you own private balcony overlooking Bourbon street. The loft features a cozy queen bedroom. You will have the same amenities as the rooms. 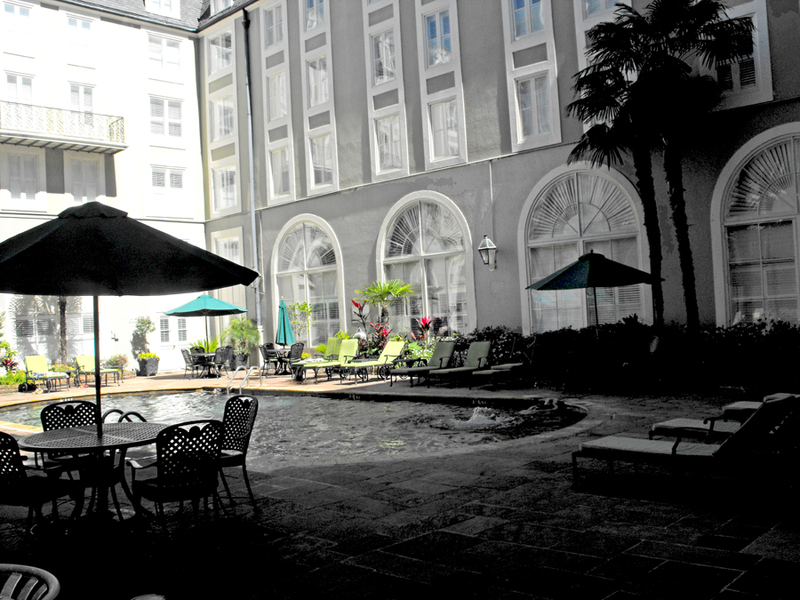 There is a heated saltwater pool nestled in a cozy French Quarter courtyard just off the lobby. You can dine or have a cocktail without leaving the hotel. 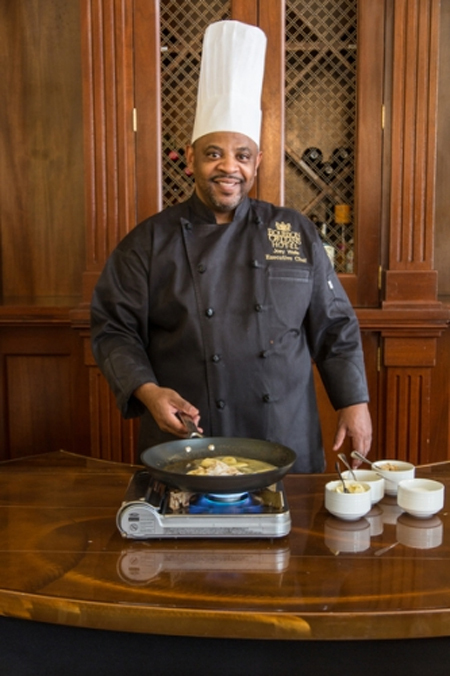 The hotel's fine dining restaurant, Roux on Orleans, serves up a tasty menu of Creole cuisine. 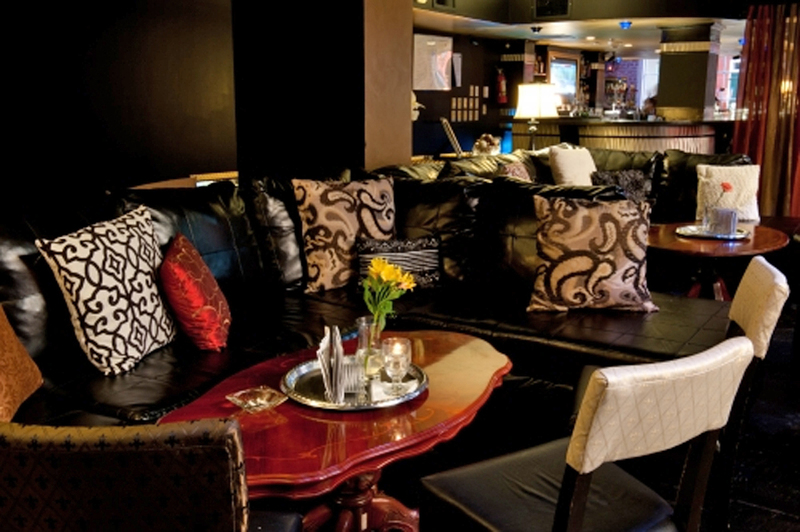 Their bar, Bourbon O' Bar, serves hotel guests a complimentary cocktail or beverage. Bourbon O'Bar does know how to mix up a wicked treat. The bar manager, Cheryl Charming, aka "Miss Charming," won the coveted title "Mixologist of the Year" by New Orleans Magazine for 2014 and another Bourbon O'Bar bartender, Steven Lemley, won the title in 2013 . They offer live music Wednesday through Saturday. Wandering around the lobby or public areas of the hotel you can feel the history reaching out to tell its tale from the profane to the profound. This was originally the site of Salle d'Orleans, one of the places where wealthy Creole planters would visit to dance with and often enter into plaçage agreements with gorgeous young quadroon women. Among the Free People of Color in New Orleans during the first half of the 19th century, a placee was respected as having a "left-handed marriage." 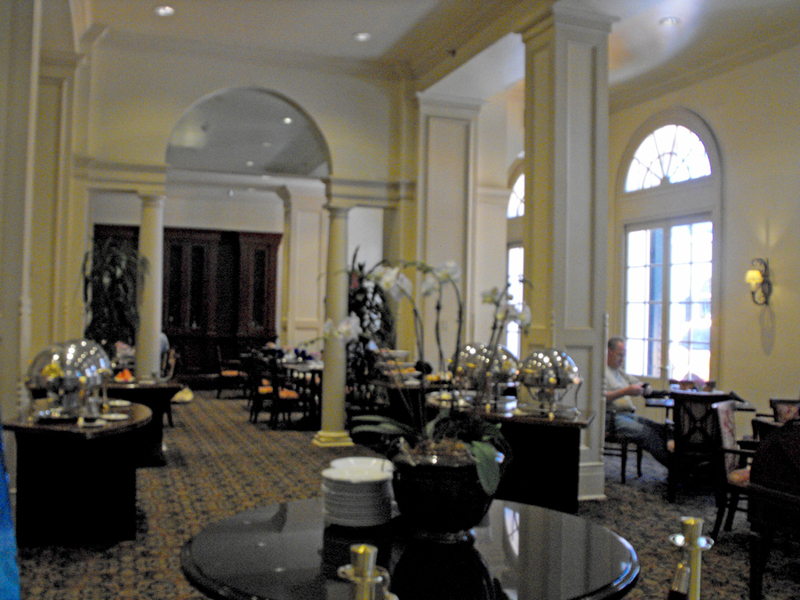 Perfect area just off lobby to enjoy breakfast or just a cup of coffee. The ballroom was adjacent to and connected by a balcony to Theatre D' Orleans, New Orleans most famous opera house. Must have been very convenient when there was an opera and a Quadroon Ball going on at the same time. Young blades could accompany their white family to the opera and during intermission slip over to view the African American beauties dancing at the ballroom. The Orleans Balllroom now serves different functions than it's original use. 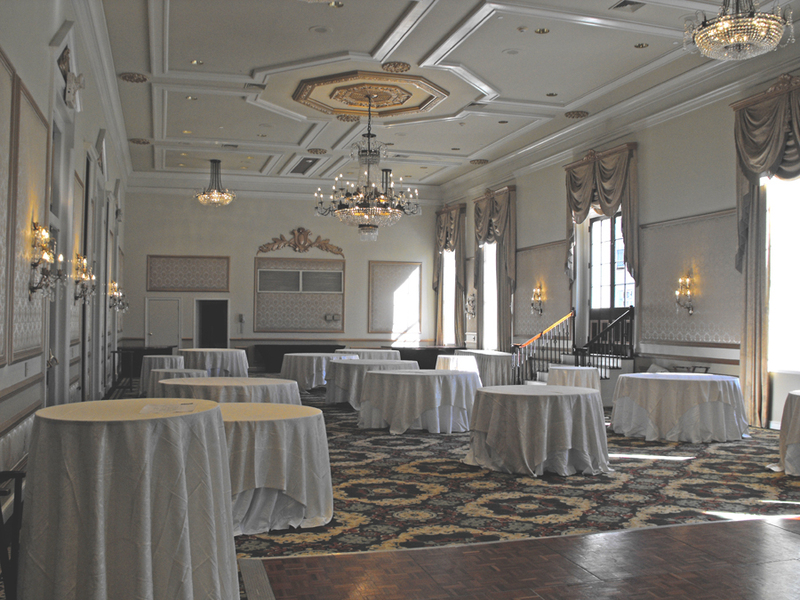 The ballroom, also known as Orleans Ballroom, was used for variety of other elite functions as well. It was chosen as the site for a gala to entertain the Marquis de Lafayette when he visited in 1825. In 1828 the Government House burned and the State Legislature met in this ballroom. From 1852 until 1881 the First District Court held sessions there. In 1866, the theater portion of the building burned to the ground but the ballroom was spared. It was in 1881 that the building entered its "profound era." It was purchased by the Sisters of the Holy Family. This was the first female-led African-American religious order in the country, founded in 1842 by Henriette DeLille, Juliette Gaudin and Josephine Charles, all Free Women of Color. Although New Orleans is best known of its Saints dressed in black and gold jerseys and tossing a football, Henriette DeLille is in the canonization process of the Catholic Church. If she is canonized, she will be the first female native-born African American saint. I first visited the ballroom in the late 1950s. The former ballroom was then a chapel and open to the public on Good Friday and my mother, a staunch Catholic, insisted we "make the nine churches," a New Orleans tradition of walking between nine churches in honor of the crucifixion of Jesus. Even as a child, I was struck by the beauty and fair complexion of these nuns. My mother then told me the story of the old ballroom and explained why so many of these nuns were so light-complexioned. It was an experience I have never forgotten. 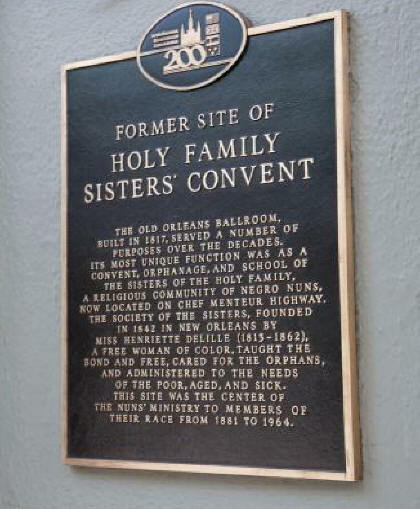 The nuns remained in residence until the 1960s when they moved to the East Gentilly section. 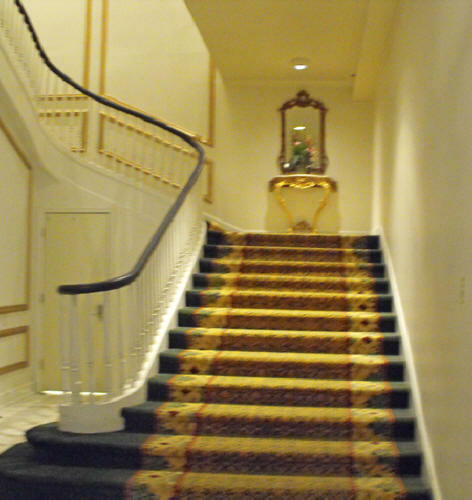 When the Bourbon Orleans Hotel acquired the property in 1964, they were very careful to preserve the original façade and old ballroom. Grand functions, weddings, carnival balls and other events, are still held beneath the Orleans Ballroom's crystal chandeliers. As might be expected with such a checkered history, there are many spirits still roaming the building. One of the specters is a ghostly quadroon girl who is sometimes glimpsed dancing in the glow of the ballroom's crystal chandeliers. Another female soul sometimes seen in Room 644 of the hotel is dressed in a nun's habit. she is believed to be the spirit of a Holy Family nun who took her own life. During the years of the nun's tenure, they maintained a orphanage and school for Black children, St. Mary's Academy, in the building. During the yellow fever epidemic of 1905, some of the orphans contracted the disease and died in the building. It is said their spirits still play in the lobby and kitchens. Workers have seen table cloths move as if someone brushed against them. Glasses unexplainably clink together as if in a mock toast. Some of the staff have felt their shirt tails or aprons pulled when no one is there. Tinkles of childish laughter is sometimes heard. A few have even glimpsed a little girl playing with her ball in the corridor. The pool is located in a beautiful French style courtyard. New Orleans was the site of a Civil War battle from April 25–May 1, 1862when Union forces invaded the city by way of the Mississippi River. (see Civil War Trails) Wounded soldiers were often nursed in convents by nuns. The Holy Family Convent probably saw its share of dead young soldiers the nuns could not save. That would explain the sighting of a Confederate soldier roaming the hallways of the Bourbon Orleans. 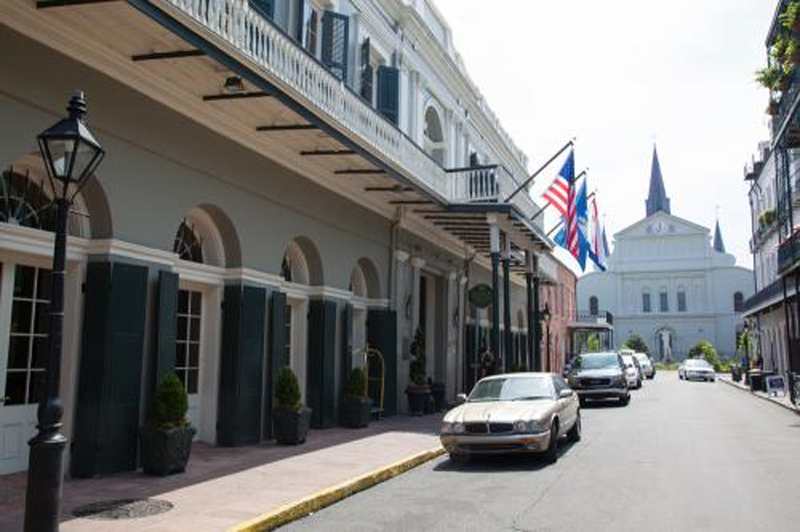 Whether you are looking for just luxurious quarters close to the heart of the Crescent City or a step back into history, I strongly recommend the Bourbon Orleans.